Any website that has commercial clients, such as advertisers, affiliates or trade-show exhibitors, can give them the ability to create online and printable coupons. It's an added-value feature that's easy for clients to use, through a simple, password-protected online form. This system makes it easy to advertise special offers, discounts and coupons. These are incentives for prospective customers to contact the business that creates the offer. Coupons work to entice prospects to come through a store's or restaurant's front door. The site's owner has the option of offering this functionality to every advertiser/affiliate, or of making it an extra-cost, premium-level service. Coupons are displayed on the sponsoring website, with thumbnail images that can be grouped on one or more pages, rotated throughout the site, and arranged according to the merchant's business category. Advertisers have complete control over what they promote, and can create, update or remove a special offer as often as they choose. It's the site owner's option whether to make coupons available to anyone browsing the site, or to restrict redemption to registered members. If this is a membership perk, the coupons can be personalized with the member's name, which will help advertisers know who their customers are. This option also helps ensure that advertisers are targeting the most qualified prospects. Coupons can be printed, or become links to any valid web page, for redemption. An expiration date feature automatically removes outdated offers. All aspects of the offer are under the advertiser's control. A coupon can be updated, revised or replaced as often as the advertiser wishes. The coupon system is fully compatible with any promotions advertisers may already offer, or add in the future. Any special offer can be linked to any page on the advertiser's website, or to a third-party coupon or discount site. The advertiser enters the redemption page's URL in a form on a secure Admin page, and our system automatically creates the link. 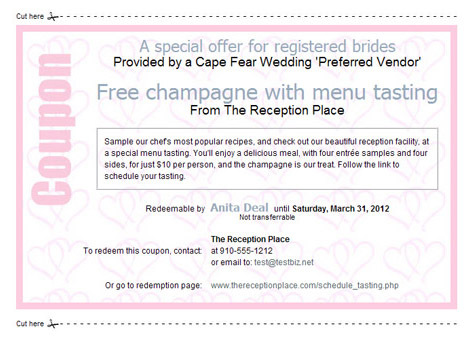 This is an example of a coupon created by an advertiser on a website equipped with our interactive special-offer system. It's personalized with member's name. To request a rate quotation, to query form. Site last updated Friday, April 19, 2019 Copyright 2019, Cape Fear Images, Inc.